In the folk or pagan metal genres there is a very wide range of styles and differing levels of heaviness. Ensiferum for instance have a strong folk feel to their latest album with a bit of metal thrown in. Other bands are more metal with a bit of folk thrown in. Korpiklaani are more towards the middle of the spectrum - it's heavy, there's no doubt about that, but the folk/pagan feel is still strong. 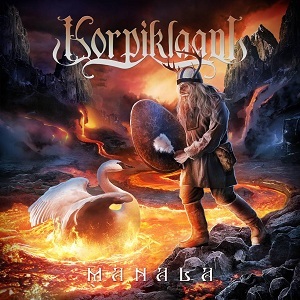 If you've listened to Korpiklaani before then you'll have a fairly good idea what to expect - it's great folk metal with a fun party feel to it. If you haven't listened to Korpiklaani then it's about time you did - they are an excellent folk metal band and well worth listening to. The album will be available as a 2CD edition. The first disc is the original album, recorded in Finnish. The second disc is an English version of the album. This is a great folk metal album - its got a great blend of metal and folk, so it's heavy without losing that folk feel, and most of all it's just got a great fun feel to it - definitely music to get drunk and party to. Highly recommended.